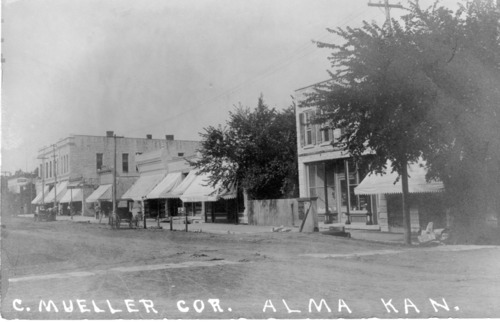 Conrad Mueller, an early Alma businessman, owned Mueller Hardware at 304 Missouri Street in Alma, Kansas, as well as the building next door in which he operated a saloon and pool hall in the late 1800s. This photo shows the east side of the 300 block of Missouri Street. The streets are dirt and several horse-drawn buggies are hitched to posts. A pile of stone lays in front of one of the stores at the far right. Several people are walking on the sidewalk. A real estate sign appears to the left and one of the awnings says "Geo. Sutherland."